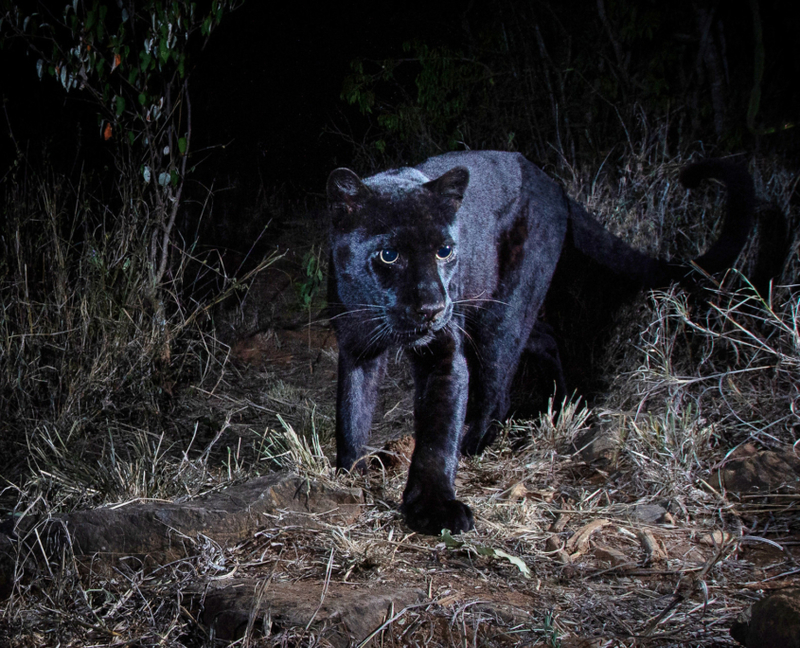 Images of a rare African black leopard have been captured in Kenya. The discovery of a black leopard in a open, arid habitat in Kenya raises questions about that theory, however. Namibia, officially the Republic of Namibia, is a country in southern Africa. Its western border is the Atlantic Ocean; it shares land borders with Zambia and Angola to the north, Botswana to the east and South Africa to the south and east. Its capital and largest city is Windhoek, and it is a member state of the United Nations (UN), the Southern African Development Community (SADC), the African Union (AU), and the Commonwealth of Nations. Namibia has a population of approximately 2.6 million, is a Unitary dominant-party semi-presidential republic, and gained independence from South Africa in 1990. The basic physical greeting is the handshake. In English, the common greeting is “hello”. In Afrikaans, it’s “hallo”. German speakers say “guten tag”, and in Oshiwambo it’s “Ongaipi”. English is the only official language in Namibia. The most common language, spoken by around half of the population, is Oshiwambo. Other common languages include Nama, Afrikaans, Otjiherero, Kavango, Lozi, San, and German. We drive on the left side of road. Due to low traffic volumes the majority of roads are not tarred. Punctuality is important in Namibia, with trying to arrive on time being part of the local culture. The music of Namibia has a number of folk styles, as well as pop, rock, reggae, jazz, house and hip hop. Folk music accompanies storytelling or dancing. The Namaqua use various strings, flutes and drums while the Bantu use xylophones, gourds and horn trumpets. The Namibian reggae platform has produced artist such as Ras Sheehama, Petu, Ngatu, who has been performing since 1994. Rock n roll is widely celebrated by the white communities of Namibia. Die Vögel is one of Namibia’s most outstanding rock n roll bands. Kwaito is also very popular in Namibia, with local artists including The Dogg, Gazza, Sunny Boy, Qonja, Tre Van Die Kasie, and OmPuff. For a taste of Namibian music, listen to Ras Sheehama’s Inotila, and Makgona Ngwao. Traditional Namibian dance occurs at events such as weddings and at traditional festivals such as the Caprivi Arts Festival. Watch an example of traditional Namibian dance here. Lusata Festival is an annual festival for all Mafwe tribal people of Namibia and nearby countries. The Mafwe people are one of the largest ethnic groups in the Caprivi Region. The festival celebrates traditional values, commemorates the past, and looks forward to the future. It occurs annually in the last week of September. The festival’s name is a reference to the royal mace – an ivory-encrusted stick. Most people from all villages in Caprivi come to celebrate by dancing and feasting. It always is held where the king stays, in Chinchimani village, 6 km away from Katima Mulilo. Held every February, the Bank Windhoek Arts Festival celebrates local artists and their work. It encourages the development of artists, helping locals establish a name in the industry and giving people a vehicle to enjoy the local design scene. A variety of events from dance and theater to visual arts are held throughout the capital. The biggest cultural event in Windhoek, and Namibia in general, is the Windhoek Kareneval or WIKA. A remnant leftover from German occupation, visitors in attendance will feel a distinct German vibe throughout the festival. Held in April, WIKA involves a number of events including musical performances and a masked ball for adults and carnival and Independence Avenue parade for kids. Having formally been a territory of the Germans, Namibians naturally celebrate what has become one of the world’s best-known drinking events, Oktoberfest. Beer, fun and games attract people of all ages to the capital of Windhoek.. The winter (June – August) is generally dry. Both rainy seasons occur in summer: the small rainy season between September and November, the big one between February and April. Rainfall is highly variable, and droughts are common. Weather and climate in the coastal area are dominated by the cold, north-flowing Benguela Current of the Atlantic Ocean, which accounts for very low precipitation (50 mm (2 in) per year or less), frequent dense fog, and overall lower temperatures than in the rest of the country. Efundja, the annual seasonal flooding of the northern parts of the country, often causes damage. President Hage Geingob has been President of Namibia since 2015. He previously served as the country’s Prime Minister, from 2012 to 2015, and its Minister of Trade and Industry, from 2008 to 2012. After obtaining a MA degree in International Relations in New York, Geingob was appointed SWAPO Representative at the United Nations and to the Americas. He served in this position until 1971. Geingob is known to be an avid football fan, and has attended many high-profile games. He also regularly attends the Namibia Annual Music Awards (NAMAs), and in his youth sang in a choir, and played in a band. The largest economic sectors are mining, agriculture, manufacturing, and tourism. About half of the population depends on agriculture (largely subsistence agriculture) for its livelihood, but Namibia must still import some of its food. Namibia is the fourth largest exporter of non-fuel minerals in Africa and the world’s fourth largest producer of uranium. Tourism is a major contributor to Namibia’s GDP, creating tens of thousands of jobs directly or indirectly, and servicing over a million tourists per year. The country is a prime destination in Africa and is known for ecotourism which features Namibia’s extensive wildlife. Locals spend their free time with family and friends, visiting the beach, taking road trips or off-roading, camping, or watching local sports matches. There are also a number of nature reserves to visit. Namibia has a strong beer culture, and produces many varieties of local beer, including traditional African millet varieties. Examples are Windhoek lager, DAS Pilsner, and Oshikundu. Despite the climate, the country also produces its own wine. When you visit Namibia, you will find that the cuisine is very different and varied. Local specialities worth sampling are Swakopmund green asparagus (September to April), Luderitz oysters (all year round), Kalahari truffles (May and June if they appear), and Omajowa, the large fleshy mushrooms that appear for a brief period at the foot of termite hills north of Okahandja shortly after the rains in February. A wide selection of home-made cheeses are made by Danis Kuche near Otjiwarongo and the production of Namibian olives — the Kalamata (black) variety as well as the green —has taken off well. In Swakopmund, Luderitz and Windhoek you can indulge in traditional German-style confectionery including classics such as Schwarzwälder, Kirschtorte, and Apfelstrudel as well as the renowned Springer chocolates produced in Windhoek. A favourite breakfast and light lunch are crisp bread rolls, referred to as Brötchen, filled with cheese, eggs, meat or salad. Namibia is generally very safe for travellers. Exercise the same precautions as you would back home: don’t have valuables on show, and don’t walk through the townships at night unless accompanied by a guide. It is safer to call a taxi than hail one on the street – your accommodation should be able to arrange this for you. Avoid driving outside of the towns at night – the roads are not lit and vehicles are in danger of colliding with roaming wildlife. Rosa Namises, a politician and human rights activist, and former member of parliament. A prominent voice on gender issues, human-rights violations, and violence against women and children in Namibia, she is the director of Woman Solidarity Namibia. Frankie Fredericks, a former track and field athlete. Running in the 100 metres and 200 metres, he won four silver medals at the Olympic Games (two in 1992 and two in 1996), making him Namibia’s so far only Olympic medalist. He also won gold medals at the World Championships, World Indoor Championships, All-Africa Games and Commonwealth Games. He is the world indoor record-holder for 200 metres, with a time of 19.92 seconds set in 1996. Trevor Dodds, a professional golfer. Turning pro in 1985, Dodds has compiled 14 wins on four different tours. Samuel Shafiishuna Daniel Nujoma, a Namibian revolutionary, anti-apartheid activist and politician who served three terms as the first President of Namibia, from 1990 to 2005. Nujoma was a founding member and the first president of the South West Africa People’s Organization (SWAPO) in 1960. He played an important role as leader of the national liberation movement in campaigning for Namibia’s independence from South African rule. Nujoma led SWAPO during the lengthy Namibian War of Independence, which lasted from 1966 to 1989. Sources: , , . Image sources: Jonatan Pie .